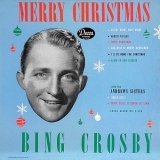 Bing Crosby I Wish You A Merry Christmas 12" Vinyl Dated 1962/ 1484 WARNER BROS.
Merry Christmas is ranked as the best album by Bing Crosby. Members who like this album also like: Folk Songs Of The Hills by Merle Travis, Ella Sings Gershwin by Ella Fitzgerald and Billie Holiday Sings (1950) by Billie Holiday. The tracks on this album have an average rating of 80 out of 100 (all tracks have been rated). Related links: top tracks by Bing Crosbytop tracks of the 1940s, top tracks of 1945. Showing latest 5 ratings for this album. | Show all 36 ratings for this album. Related links: top albums of the 1940s, top albums of 1945.